National Taiwan University, according to the resolution of the 2674th University-Affair meeting in June 21st, 2011, approved to establish Research Center for Climate Change and Sustainable Development to integrate relative human forces and resources, and to facilitate inter-disciplinary co-operation, so as to focus on Taiwan’s challenges and issues, to design research orientations for important issues, to research on complete strategies for national climate governance, and to define different roles that governmental organizations and citizens shell play. We aim at proposing concrete outcomes, and becoming an important consultant for policy making, and furthermore, assisting relative industries to form a firm basis in global markets, and ultimately elevating Taiwan’s national competency. 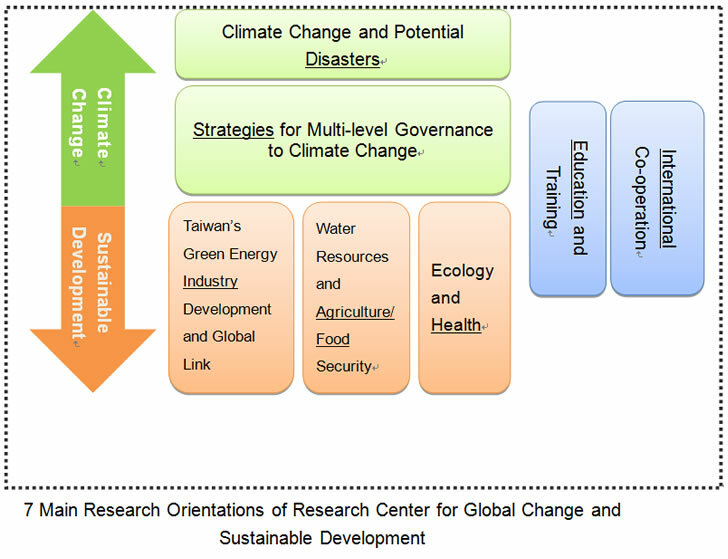 This center is established to integrate and elevate NTU’s research in climate change and sustainable development, and to a build a research team of world-class excellence, so as to be in response to demands for development and to assist government, enterprises and non-governmental organizations to realize relative policies and technology applications. 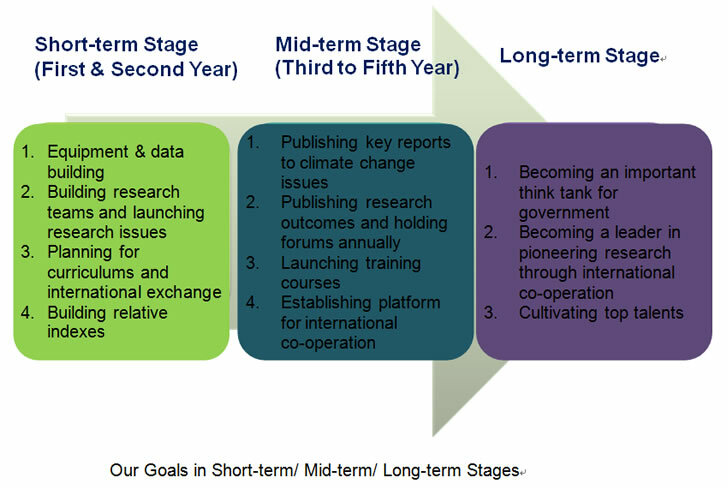 In the first stage, we set up seven development orientations to cover key issues on climate change and sustainable development; there are seven teams as illustrated above, including “Climate Change and Potential Disasters”, “Strategies for Multi-level Governance to Climate Change”, “Taiwan’s Green Energy Industry Development and Global Link Strategies”, “Water Resources and Agriculture/Food Security”, and “Ecology and Health”; to take human resource development into account and to expand influence, “Education and Training” and “International Co-operation” are included as well. In order to meet actual social and economic requirements, now we are working out on the eighth orientation, that is, a team for “Society and Economy”. Furthermore, we will add other teams for proper projects in response to research or national development requirements, or adjust and merge different teams to meet the high expectation from our society.